Mini-man has many flights under his belt now – but I was really nervous to see how he would handle flying. 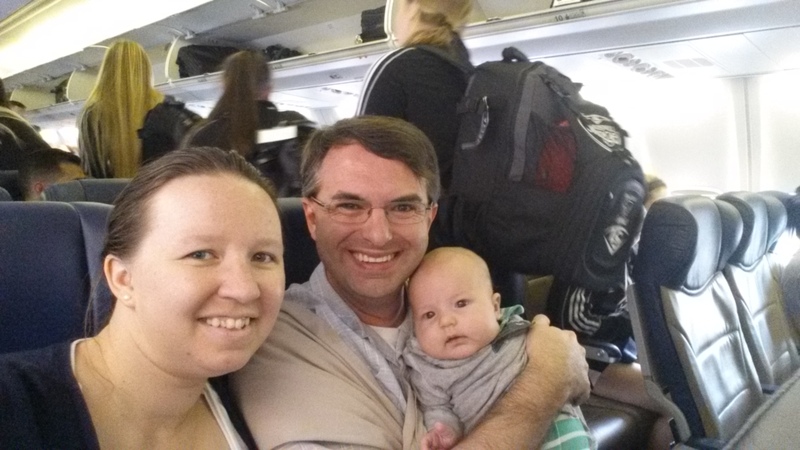 See how we handled his first flight and helped set the tone for his future flights. Just days after sailing with mini-man for the first time, we needed to travel to Atlanta – which meant mini-man’s first plane ride. Like most parents, we were nervous how he would handle this flight. I have been on flights before with flying babies who were crying at the top of their lungs and hated it. I didn’t want mini-man to be in pain from the flight and I did not want to disturb our fellow passengers. In anticipation of our trip, I did some research to see if there was any way to make the flight as comfortable as possible for mini-man. Turns out a little preparation goes a long way! I learned that changing prior the flight and feeding during take off helps the baby feel more comfortable and actually enjoy the flight. We applied these techniques and had a really smooth flight (both directions) with mini-man. The funny part? A woman did not want to sit next to us because we had mini-man. Instead she sat near a four/five year-old who screamed most of the flight, while mini-man was quite and having fun! Changing Prior to Boarding: Making sure that mini-man had a clean diaper made him comfortable. Comfort = happy baby! Feeding During Take-off: We all know how uncomfortable take-off can be on our ears. An infant doesn’t understand what is going on and can get upset pretty quickly bu this. By feeding during take-off, it alleviates the pressure on their ears which prevents crying. Again, comfort = happy baby!